PlanetMoney has some interesting plots covering the 70's to today showing Who Studies What? Men, Women And College Majors I've looked at similar topics here and here. Oops. sorry, I forgot to make it spooky. The kind of return you can get from a rental property varies a lot based on the local real estate market. I figured I could use average rents and median home values to give a crude estimate of the approximate rental returns for a given area. This isn't precise though since the median home will have different characteristics than the average rental. The home is likely to be larger and have more amenities, etc than a average rental. But for my purposes of giving a rough gauge of the returns for a rental market, I think it is good enough. To give a single data point on how the table below might compare to actual property values and rents I decided to look at Vegas. I pulled up Zillow and searched for houses in Las Vegas from $100-$125k and found a house for $105k with 3 bed/3bath. Zillow estimates the rent would be $1020. I then checked Craigslist and searched for 3 bed rentals under $1200 and found a couple houses with 3 beds for $1000 and $1100. These figures compare to the median home values of $124k and average rent of $957 in the table. Also of course what I'm looking at on Zillow and Craigslist is in 2014 versus the data below in the tables being from 2011. The table below lists the median home values in $1000, monthly rental costs and then the return rate calculated based on simply 12 months of rent / median house costs. All the figures below are from 2011 as thats the latest I found all the data available. I was going to add in the property tax rates and figure the return after accounting for average property taxes. However I can't account for the impact of homestead exemptions so that would make that calculation kind of worthless. This does not account for the expenses which vary as well. In a recent article T.Boone Pickens said we should use natural gas cars more. I agree in general. Natural gas is more abundant and cheaper here in the USA than oil. It doesn't require refining and is pumped straight to most homes. Natural gas burns cleaner than gasoline too. Apparently the only natural gas car out there is the Honda Civic GX. They cost $25-30k which is about the same as a Civic Hybrid. 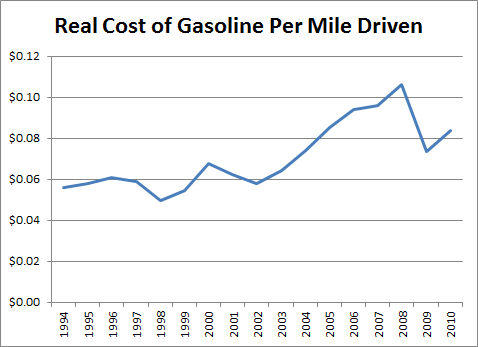 However the natural gas car should save you around $200-500 a year in fuel if you drive 15,000 miles a year. There is also apparently a Ford F-150 truck option for CNG/LNG but thats a new option and I don't see as much on it. They do say that tanks would cost $6000 to $9000 which I think would mostly make that kill that as far as cost effectiveness. There are some state level tax incentives as well. Apparently 20 states have some sort of incentive. You can find it your state has incentives here. Oklahoma gives 10% of vehicle cost up to $1500. Texas rebates $2500. Pennsylvania has a $1000 rebate. I'm not sure about the details on the tax credits or rebates so you'd want to research that on your own. How much you save with natural gas will vary though based on the cost of natural gas in your area. The average price of natural gas nationally is about $1 per therm for residential rates.. The natural gas equivalent to a gallon is about 1.14 therms. So on average the cost is $1.14 for natural gas equivalent to a gallon of gasoline. Natural gas prices vary across the nation. The EIA tracks natural gas price data by state. Its over $4 per therm in Hawaii and under $0.80 per therm in Colorado. Prices at public fueling stations seem to be more than home prices. Public stations tend to range around $1.50 to $2.50 a gallon. A map of prices is here. Honda does not recommend home refueling according to the Civic GX owners manual. "Due to the wide variation of natural gas quality for home use, Honda does not recommend the use of home refueling at this time" I don't know if home refueling hardware does a good job of ensuring the gas is filtered properly or not. If you did fuel at home you'd have to buy the refueling hardware and have it installed. That can be as much as $6000 total bill. Public CNG stations are limited. This is a major draw back to natural gas cars and a key reason we don't see more of them. But that makes ita chicken-vs-egg situation. There aren't enough refueling stations to drive demand for cars but lack of cars doesn't give incentive to open more refueling stations. The Honda GX has only about 8 gasoline gallon fuel capacity and mileage of 27 city/ 38 highway, so you can only drive around 200-300 miles. There is a map on the EIA site. I captured their map below. Note the light red sites are private so only the dark red locations are of use to the general public. Theres large sections of the nation with no refueling locations at all. Looks like South Dakota doesn't have a single refueling station. You'd have a hard time driving from Seattle to anywhere else I'd imagine given the lack of public stations outside the Puget Sound. But refueling at your home exclusively would probably work just fine for most people. A 200 mile local driving range is more than enough for anything but longer distance day trips. Overall I like the idea of natural gas fueled cars and they can make sense. Its cheaper to operate than a gas based car and some states have tax rebates to boot. If you're looking at a Honda Civic or similar size car then the natural gas based Civic GX might be worth a look. But I'd definitely make sure the finances make sense. If you have to buy a home fueling station then that extra cost can make CNG car more expensive overall even with cheaper home natural gas. DoughRoller discusses Should You Use a Roth IRA as an Emergency Fund? Barry Ritholtz asks How Low Can Gold Go? I think that the number of comments an article draws is one way to measure how interesting an article is. Below I list the articles that I've written that have had the most commentary. Costco Fuel Temperature Class Action Lawsuit : What does it mean? This one seemed to upset some people who were mediocre high school students.. There have been several UPS drivers/employees commenting to share their personal experiences. Some people thought I had an agenda on this one, but I didn't. Of course this draws the immediate 'its not possible' responses from people living in NYC or S.F. For some reason this attracted people to say they were different. I'd like to see those 2 in a bare knuckle fight. They could charge $50 for PPV. I don't get a lot of comments on my articles usually. A post with a dozen comments is unusual for me. I think part of it is how poorly designed this blog software is, it makes it hard to even see where the comment link is. I haven't found a way to fix that other than migrating to entirely new software which is not a task I feel like tackling. If you are an Amazon Prime member then you can get 50% off your first product purchase through Subscribe and Save. This would be a good way to save a fair amount on a bulk order of paper towels, a case of baby diapers or toilet paper . Theres several items like that on S&S that can normally run $20-50 and 50% of that is a good deal. What Percent of College Students Work While in College? I almost always had a part time job during college and I think most people I knew worked in college as well. I remember one guy in the dorms who didn't work at all and his parents were paying for his college and giving him an allowance of some sort. At least one other guy was an athlete on scholarship and he didn't have a job. In fact I'm not even sure scholarship athletes are allowed to have jobs while on campus but thats beside the point. One guy had a part time type job as a street musician of all things. I don't think his roommate worked. But overall most people I recall seemed to work. 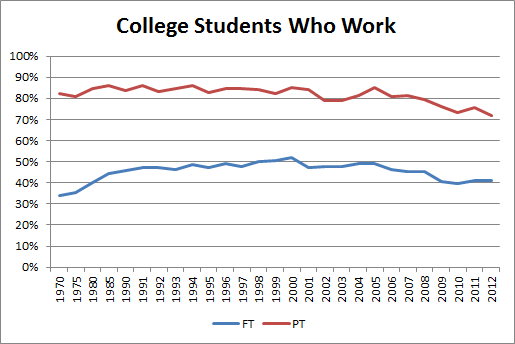 As of 2012 : 41% of full time students are employed and 72% of part time students work. As you can see in the past 10 years theres been a fair drop in the % of students working. I'm guessing thats a result of the recent recession and the employment environment, but thats just me speculating. Retireby40 asks Do You Benchmark Your Net Worth? MyMoneyBlog discusses Feel Like You’re Always Eating Out? You’re Not Alone. We've got a couple mortgages that we only recently got within the past few years. 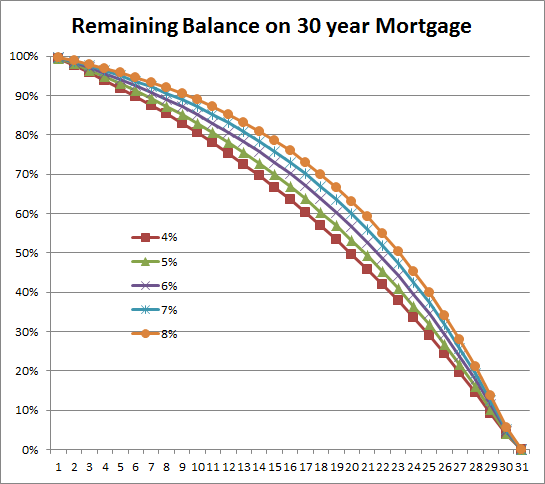 The mortgages are both 30 year notes and so I'll still owe on them when I'm in my 60's and past retirement age. I was curious how much I'd owe on the mortgages so I used the calculator at Mortgagecalculator.org to generate amortization tables. One might assume that when you're 15 years into a 30 year mortgage that you'd have it half paid down. But thats not now it works. Mortgages payments are mostly interest at the start and little principal is paid initially. Then as the principal gradually wears down over the years when you get to the end of the original term the opposite is true and most of your payments are principal and (relatively) little interest is paid. You can see the data below but roughly speaking, for a 4% loan you've paid down just 10% in the first 6 years, 20% in 10 years, 1/3 is paid off by 15 year point and 50% is paid off in 20 years then by the 24th year you've paid down 2/3. I'm measuring the amounts in the % of original loan that is still owed. So in the 1st year you still owe nearly all of the loan so its 99-100% (rounded). I'm assuming the normal amortization repayment rate here and if you paid extra principal into the loan at any point that would accelerate the repayment and change the curve.